Christine and I had dinner here on Friday night, taking advantage of their happy hour deals. The bar area was hopping, but we were able to snag a table at the edge of the room. We shared a cheeseburger ($6), truffle fries ($4), wild mushroom risotto fritters ($5) and a duck and goat cheese quesadilla ($11). The cocktails were all $6 and even through I was embarrassed to order a drink called a “flirtini,” it was pink and delicious (absolut raspberry, prosecco, fresh lime, cranberry & pineapple juice). I thought all the food was great. The cheeseburger was a perfect medium rare; it had a tender and flavorful patty. 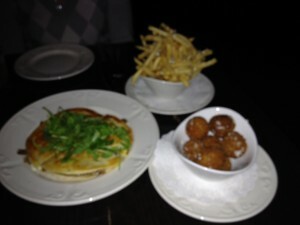 The fritters were crispy and delicious, although I don’t know why they don’t just call it an arancini? The fries were thin, crispy and generously topped with a mountain of parmesan. The service was less than attentive, but that is to be expected during happy hour. The affordable prices make it worth the lack in service. I wish Boston had happy hour deals like this.